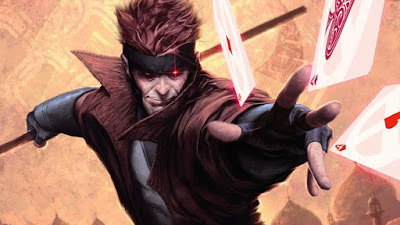 Miraculously, and maybe not so coincidental Channing Tatum has closed his deal to take on the titular role in the X-Men spin-off movie, Gambit, for 20th Century Fox. Earlier reports had the Magic Mike star walking away from the project due to negotiating snags ("backend compensation") with the studio. Somehow those reports that made negotiations public now lead to a finalized deal. Funny how that happens. Haters were only able to rejoice momentarily because in all honesty despite the negotiating ploy, Tatum was already well-invested in the project going back years and he was also introduced on stage at Comic-Con as Gambit. The studio would make every effort to sign Tatum to a long-term deal to save face and prepare their X-Men franchise post-Wolverine. Hugh Jackman is hanging up the adamantium claws after his next Wolverine feature in 2017 leaving a void in the Fox-Marvel universe they hope will be filled with Fantastic Four, Deadpool and Gambit. Tatum used his leverage wisely and got the deal he felt he deserved. Although, Tatum has yet to prove to be a draw as a leading man and carry a film. It may not matter given it's a comic book movie with a great character, albeit obscure for most, and the Marvel name attached.